As a legal form, treaty making is not new and can be traced back to the centuries before the dawn of modern international law. But the regulation of words, signs, and signals by means of treaty agreement is a recent development, for sovereign states in Europe and elsewhere had not been concerned with such matters until the mid-nineteenth century. The novel inventions in the areas of military signals, maritime signals, and telegraphic technologies required a proliferation of international conventions and treaties charged with the regulation of existing natural languages and the adoption of code systems. These had included the Morse code or the telegraphic code invented by Samuel Morse, as well as artificial languages like Volapük by Johann Martin Schleyer in 1879 and Esperanto by Lejzer L. Zamenhof in 1887. The Délégation pour l’adoption d’une langue auxiliaire internationale (Delegation for the adoption of an auxiliary international language) was formed in 1901. Treaty making between Britain and China began with the first Opium War in 1839. Before that time, tensions began to develop between the two countries after the expiration of the Charter of the British East India Company, which had held a monopoly of British trade in Asia, including China. There had been decades of complaints by the British merchants working outside the monopoly of the British East India Company, who wanted a share of the legitimate trade with China. Pressure from these “country merchants,” as they were called, was so great that King George III decided not to renew the Charter of the British East India Company. At this time, it became necessary to send a formal representative of the British government to China to represent British interests because previously—outside the East India Company—Britain had no formal framework for negotiating with China. An English war vessel having on board a barbarian eye, had from the outer seas, sailed to Cabreta Point (off Macao)……The barbarian eye who has now come is of course for the superintendence and examination of this business. And the barbarian eye is not on a par with the taepans [supercargos]. If he wishes to come to Canton, it will be necessary to make a clear report, requesting the imperial will on the subject. The Chinese Repository, 3.4 [August 1834]: 187. The word “eye” was italicized in the original text. This, of course, was the British translation of a Chinese document. Even among the British, there were those who disputed this translation. Nonetheless, Napier was infuriated with what was represented as disrespectful treatment by the local government. He called Lu Kun “a presumptuous savage” and vowed to punish him for committing an outrage on the British Crown. His Majesty, the King of England, is a great and powerful monarch, that he rules over an extent of territory in the four quarters of the world more comprehensive in space, and infinitely more so in power, than the whole empire of China; that he commands armies of bold and fierce soldiers, who have conquered wherever they went; and that he is possessed of great ships of war carrying even as many as 120 guns, which pass quietly along the seas, where no native of China has ever yet dared to show his face. Thus, on 11 September 1834, two British sloops of war, the Imogene and Andromache, arrived and anchored at Huangpu (Whampoa), and Napier launched an attack on the Qing troops. Therefore, the first British military action in China was caused, neither by opium nor by trade, for the British trade would actually suffer from the conflict. The direct cause of this prelude to the first Opium War was in fact Napier’s determination to defend the hereditary status and honor of Her Britannic Majesty. Unfortunately, Napier’s action had disastrous consequences, not only for China but also for himself. The difficulty of making a war amidst the extreme heat of Canton’s summer aggravated his health and led to his death on 11 October 1834. Following Napier’s death, sixty-four British merchants in Canton led by the families of major opium traders, William Jardine and James Matheson, drafted a collective petition to the King’s cabinet, the “King in Council,” on9 December 1834. The petition requested the appointment of a plenipotentiary backed by three warships and empowered to demand from the Qing court the dismissal of Lu Kun and redress for the trade stoppage. It urged the British government to put a stop to the external and internal commerce of the Qing and take possession of all the armed vessels of that country, and so forth. War appeared inevitable in light of how the injuries and sufferings of Lord Napier were perceived by the British subjects at the time. Five years later, tensions could no longer be contained. Commissioner Lin Lin Zexu was delegated special powers to search out and sieze opium. When he arrived in Canton (Guangzhou), he came upon several British ships carrying some 20,000 chests of opium. 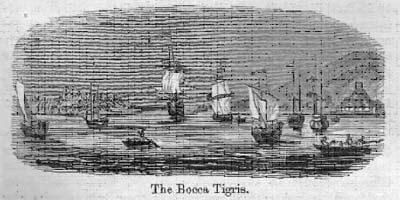 He siezed the drugs and had them destroyed with fire and lime near a place the Europeans called “Bocca Tigris,” or mouth of the river, where the destruction could be seen by the Europeans. From a modern perspective, it would appear that he did what one would expect of any decent customs officer, namely, he ordered the confiscation and destruction of addictive and dangerous drugs and the punishment of those who smuggled them illegally into his country. The British, however, were outraged by this act, and so began the Opium War. by Miss Corner (London: Henry G. Bohn, 1853), p. 233. Click HERE for GLOBAL CONTEXT.